I have had a baby boy. I have nearly finished a full gut and remodel of our new home. I worked my night job at Delta Airlines. I have entertained guests. I have worked on projects for Telemark Skier magazine. I have worked on projects for Vertical Integration. I have done a whole lot of everything recently... except skiing. My life had gotten so busy that at two different points in this winter I went without a ski day for long periods of time. I missed all of October, November and December in the first push, and then half of January and all of February in the second push. To most, this is no big deal. However, for me, it was a painful sacrifice to make. All that said, the sacrifice has paid off. 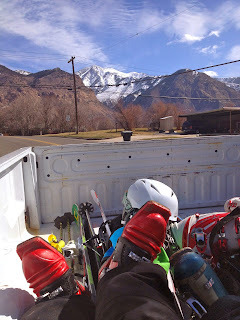 ^This scene was a fitting metaphor as I drove up to my local home mountain, Snowbasin. The clouds were thick in the lower elevations, and as I drove up through the fog I thought about how I was doing the same in my life. I had been in the fog of sacrifice and hard work for quite some time. Now I was emerging from that fog of life to have a day in the sunshine on my skis once again. ^As I pushed up through the fog, the view of my beloved home resort revealed itself to me, and I felt a rush of relief that only this place can provide. 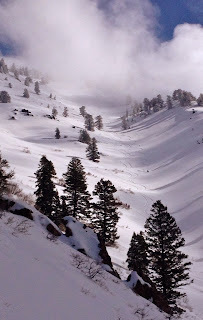 By now I have been skiing this mountain basin for over a decade and it holds a very dear place in my soul. 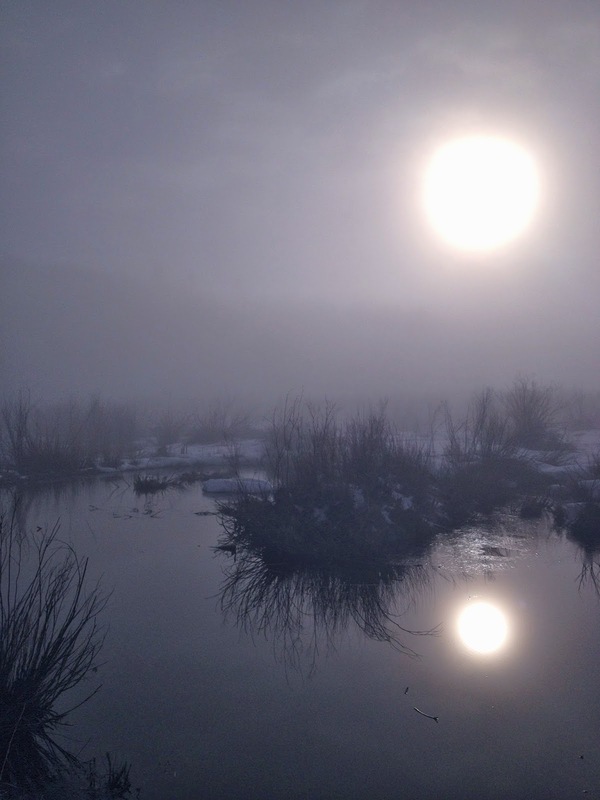 On this particularly emotional day it's slow foggy emergence seemed so pertinent to the moment. ^My best bud and morning cross country skiing partner, Murphy Mae, was super stoked. She hangs on the construction job site with me all day as well. 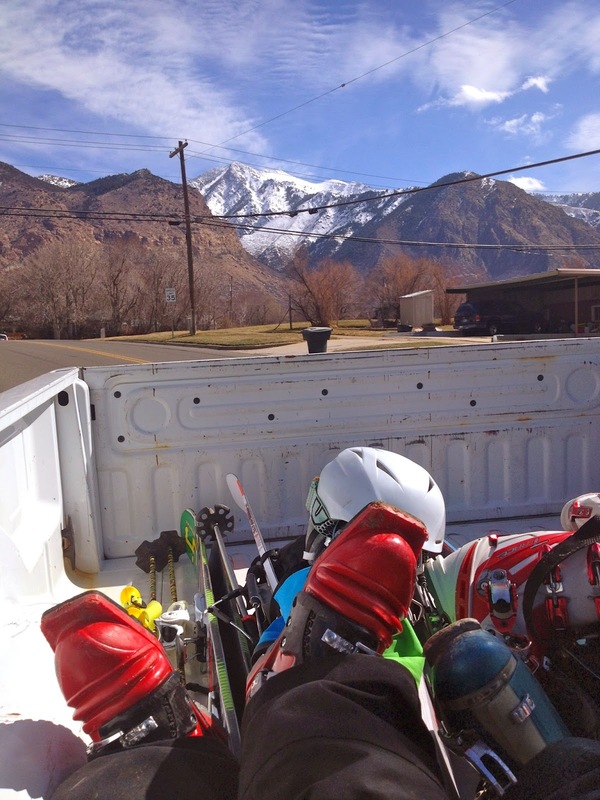 Therefore, long stints of work means she doesn't get to ski either. She was like a elated young puppy out there despite her age. Her stoke feeds my stoke, and we had a special morning in the half-lit foggy sunrise before the lifts started to turn. ^A typical drink for Murphy from the beaver ponds always affords a moment of reflection and morning silence. This particular morning that moment was especially different with the low hanging clouds playing games with the morning light. It offered a surreal-ness to the tour that added to our upward spiral of our high spirits reinforcing each other. The more excited she got, the happier it made me. The happier I was, the more spry she became. ^In my older age now I have come to realize the fleeting nature of the existence I have been blessed with. It seems I take a deeper and deeper appreciation from moments like this. I think my absence from the mountains has helped me feel that gratitude even more this winter. ^When the lifts started turning I packed Murphy snuggly away in the car as usual, and met up with some of my oldest ski buddies. They were just excited to see my call, and went out of their way to hook up with me. After a good lashing of ball busting and razing from the boys we got up to run down some of the local classics. 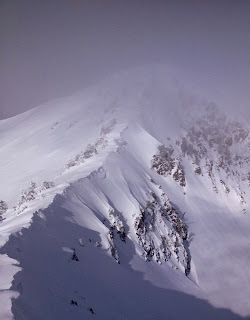 ^After a good one in Porky Cirque we headed over to an old favorite, the Finger Chutes, down ridge of Mt. Ogden. 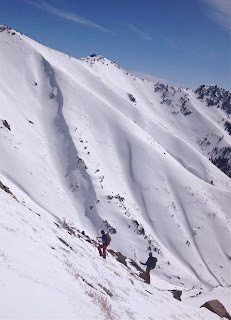 As we approached the chutes we peered into another of our favorite backcountry lines on the west face of Mt. Ogden. Not surprisingly we noticed that the set up was right, even more so then the original objective. My friend Ben had staged a car in our usual spot, so we made a call to take the plunge. Sometimes you have to read the situation and act accordingly. This day, this time, all the signs pointed to go. ^Everything felt right because it was right. The three of us had a glorious run through one of our classic favorites. Ben wraps up the line in the photo above after Wes and I had our go at it. It was an all-time cruiser. We have had a lot of those in our days, but this one felt a little more special due to my recent schedule and absence. ^No gnarly craziness or high adrenaline fix, but we were on cloud nine. We had a good run in the sun with each other for the first time in too long of a time. However, these days I find a lot of solace in quality over quantity, and the quality was very fine. ^This ridge is an old and dear friend in and of itself. I am glad to be back in the neighborhood. ^The dry hike out the bottom. As we emerged into the more relatively well traveled parts of the foothills towards our ride we came across an older gentlemen. He was taken back at our presence, but excited at the change of scenery. He asked us a standard question that kind of struck me different this time for some reason, "Was it worth it?" he inquired. Of course in the moment we laughed and replied, "Of course!". However, as we parted ways and he snapped a picture of us on his iPhone, my mind began to wander on that question he asked, "Was it worth it?". All I kept thinking was, "Worth what?". Worth the effort? Worth the risk? Worth the time? Worth what? ^Driving away from the trailhead in the back of a pick up truck I decided that anytime I came across that situation (because it kind of happens a lot here when we emerge from the woods onto a trail clad in way too much gear for the average Joe) that my answer to the question will be just that, "Worth what?" and then wait for an answer. The effort? It is part of the point. The risk? I thrive on it. The time? I would not rather spend my time any other way then with two of my best friends and trusted tour partners in some of the most beautiful terrain on earth doing what I feel like I was born to do. I am at home doing this, and that is worth the world to me. ^About the only other place I'd just as soon spend time is in this kind of company. After an amazing day in the warm mountain sunshine an evening with my young family puts the icing on the cake like no other. A grateful day in such beauty fills my heart with the kind of love I want to spread all over my beautiful wife and new baby boy. ^As my young boy, Amos, blows my mind by actually watching the game's action while he sits on his mother's lap, I snap photos of his gaze. My whole life has taken on a new light since he came, which is a total cliche for a good reason. He gave me pause in the mountains, and a reason to take risk more seriously as well as often taking on less of it. However, I will always still take on a bit more risk, effort, and time in the mountains then most would probably judge as a sound decision. Hopefully one day he does understand. My life may take some of my time from him and his mom, and may even take me from them all together some day. However, that same life is what gives me the rare blessing to have the slightly more extreme dualities of risk and reward that affords me the wisdom and depth of such deep appreciation and gratitude for each and every blessed moment like this one of him watching his first basketball game. Destiny, or god, or whatever power, willing I will get to see so many more of his firsts, but my perspective and life thus far has blessed me with the ability to notice, appreciate, and hold on to moments like these with every part of my being. They are so fleeting, so precious, but so prevalent when you seek them with everything you've got. Now as the full moon rises while I write of this reflection I give thanks for another series of great moments that made their way to me. I am just thankful for the people who facilitate them, and that I am able to see and take them all in to an already full heart.